For many years now, girls young and old have been using fake fingernails to enhance their appearance. These acrylic versions of the genuine article are stronger than real fingernails, simple to apply, affordable and fashion forward. All you have to do is choose the nail pattern that is right for you and place it on top of your original nail, securing it with nail glue. However, when positioning the nails, it is all too common to end up with a bit of nail glue on your finger. 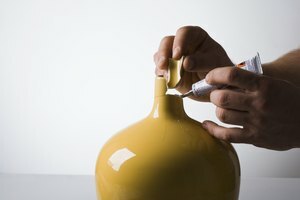 There are a number of methods you can use to remove any misplaced adhesive. Begin by soaking the affected area in hot, soapy water. Put 1 teaspoon of liquid soap in a large bowl. Add water that is as hot as you can bear to touch, until the bowl is three-quarters full and sudsy. Submerge the glued skin in the water. Let it soak for at least 15 minutes to loosen the adhesive, and then scrub the wet glue with a nail brush or old toothbrush. Repeat if necessary, removing the glue one bit at a time. Douse a cotton ball with a nail polish remover containing acetone. Place the cotton over the glue and hold it in place for 5 to 10 minutes. Acetone is a powerful solvent and will break down the bonds of the nail glue. However, the adhesive will need to remain covered for a few minutes, which could be uncomfortable if it is located next to a break in the skin, such as a hang nail. Check the nail care section of your local beauty supply store. Many specialty stores stock products designed specifically for detaching false fingernails. Apply fake nail remover to any residual glue for quick removal. Use acrylic nail remover, if you can find it. This product is intended for those who frequently use artificial nails and would benefit from having a ready supply of it on hand. The product works a bit like an eraser. It is applied directly to the area where the nail glue has been erroneously applied. The skin is then rubbed vigorously with a towel until the glue pulls away from the skin and forms a small ball, which is discarded. 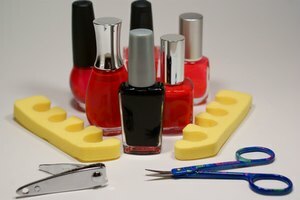 If you are unsuccessful in removing the glue on your own, a nail salon should be able to do it for you.